Land Solutions will provide each client with a complete range of land surveying services, including boundary surveys, legal descriptions, control surveys, and right-of-way surveying, in accordance with Idaho Code and other local specifications and standards. 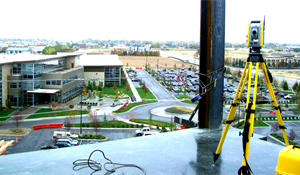 Land Solutions has successfully initiated and completed several local land surveying projects. The following projects highlight recent projects performed by Land Solutions. Land Solutions is contracted as a sub-consultant to Six Mile Engineering for the Ada County Highway District to provide surveying services for this project. The project consists of the 2nd phase of the Meridian Split Corridor project, and will be for the design of roadway improvements along Meridian Road, from Franklin Road to Cherry Lane. Surveying services include gathering topographical and cross sectional information along Meridian Road from Franklin Road to 1000 feet north of Cherry Lane, and along Cherry Lane 1000 feet east and west of the intersection. The survey corridor for this project is about 70' each side of the section line. Services also consist of research of the parcel ownerships, property owner negotiations and permissions, right of way and property delineation, creating a digital terrain model for the project, and preparation of legal descriptions for right-of-way takes and easements. Land Solutions is contracted as a consultant to HDR and is currently providing surveying services for the Southeast Idaho Energy project for Refined Energy Holdings located American Falls, Idaho. The project is for the design and construction of a new coal gasification plant and railroad re-alignment for the refinery. The project site is approximately 464 acres, and surveying services consist of obtaining and delineating boundary and right of way information for the project parcels and roadways, right of way determination for the Union Pacific Railroad located within the project, obtaining complete topographical information for the project site and generating a DTM of the project surface, staking various proposed alignments for the new railway lines and new right of way, and surveying in the location of environmental and geodetic testing for the project. New legal descriptions shall also be created for any right of way takes and easements that will be required for the project. All surveying is done on a local Idaho State Plane Coordinates projection, and NAVD88 datum. 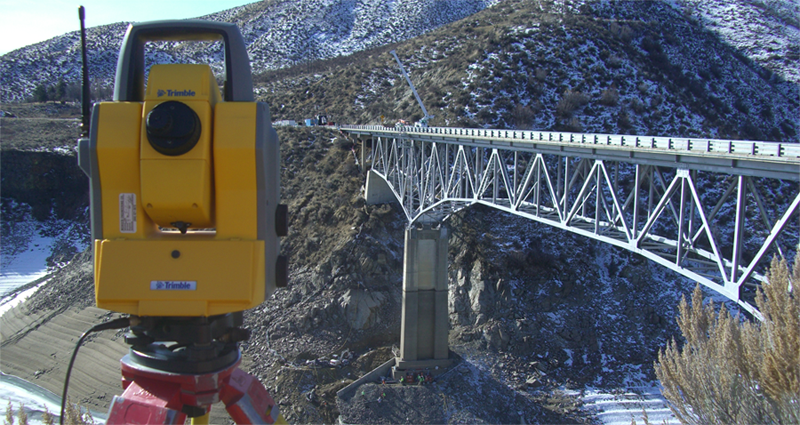 Land Solutions is contracted as a sub-consultant to Six Mile Engineering for the Idaho Transportation Department to provide surveying services for this project. The project consists of establishing the concept design of the bridge replacement and re-alignment of SH-55. 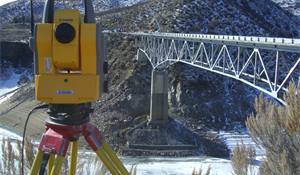 Surveying services include gathering topographical information along SH-55 from the north side of the existing bridge over the Payette to 1000 feet north of the bridge. The survey corridor for this project is 100' outside of the existing right-of-way on both sides of the highway. Services also consist of research of the parcel ownerships, property owner negotiations and permissions, creating a digital terrain model for the project, and preparation of legal descriptions for right-of-way takes and easements. Land Solutions provided surveying services for this project as a sub-consultant to Paragon Consulting for the Nampa Highway District. Services included establishing control for the project and surveying monumentation along the project corridor for use during the construction process, surveying in the location of the current roadway (under construction) and provide information to Paragon Consulting for analysis and re-design, and establishing the new centerline alignment points and points on the left and right sides of the roadway for use during construction. The Nampa Highway District was able to lay-out the rest of the road way improvements based upon our control points that were established. Land Solutions was contracted by RSCI to perform control surveying on the sewer treatment plant for Avimor Subdivision, just outside of Ada County. Avimor Subdivision is a very large scale, planned unit development located off of Highway 55, just north of Shadow Valley Golf Course. Land Solutions was contracted to verify the current location of the control monuments established in the field by another surveying firm, and to establish additional control points around the project site for utilization in the construction of the sewer treatment plant. As a subconsultant to Six Mile Engineering, Land Solutions provided surveying services for this ACHD intersection and signalization improvement project. Services included establishing the project centerline control for Front Street and 5th Street, establishing bench marks for use during the construction process, establishing additional control for the project, performing topographical mapping of the project site for design, and performing construction staking for the new design of the intersection. As a subconsultant to Six Mile Engineering, Land Solutions provided surveying services for this ACHD intersection and signalization improvement project. Services included drafting and delivering property owner notices, establishing the project centerline control for SH69 and Columbia Road, right of way delineation, establishing bench marks for use during the construction process, establishing additional control for the project, and performing topographical mapping of the project site for design. Land Solutions will also provide legal descriptions and demonstration staking for any right-of-way acquisitions or easements to be obtained throughout the project. As a subconsultant to Six Mile Engineering, Land Solutions provided surveying services for this ACHD alignment and right-of-way study project (approximately 4 miles) in Boise. Services included surveying the existing monumentation along the project corridor and establishing control for the project and then calculating and drafting all of the right-of-way for the properties along the project corridor. Deeds for the properties were researched to determine current right-of-way and ownership , and all drafting was performed to ACHD standards. The project was divided into two separate phases, with the first phase being two miles of the corridor and the second phase being the remaining two miles. Both phases were completed on schedule. Land Solutions provided topographical mapping services for WJA Architects at the Mountain Home Air Force Base for the Improve Family Housing project. The project consisted of surveying in the locations of 30 existing housing units, garages and parking areas, curb, gutter and sidewalk, and various utilities. Existing control points were provided to Land Solutions for the datum, and Land Solutions created a project projection based on WGS84 coordinates, UTM Zone 11 and verified the control points provided. All topographical information was drafted in AutoCAD format and submitted to WJA Architects. All surveying was completed on schedule. Land Solutions provided surveying services on approximately 4000 lineal feet of roadway in downtown Buhl along Highway 30. Control surveying was performed to establish State Plane Coordinates (Idaho Central Zone) and NAVD88 vertical datums. Control surveying was also performed to establish centerline and right-of-way control throughout the project. Topographical mapping was performed along the roadway sections to include all utility information, existing roadway profiles, curb and gutter, sidewalks, trees, road access points, current roadway striping, and all other relevant topographical data. Cross sections were performed at 50 foot intervals, and profiles of the roadway were surveyed using differential leveling techniques. Benchmarks were established along the project at 500' intervals. Joslin Field Taxiway Delta Extension; City of Twin Falls; Debco, Inc.
As a subconsultant to Debco, Inc., Land Solutions provided construction staking for this taxiway extension project (approximately 5300 linear feet) in Twin Falls. Services include surveying of control and establishing benchmarks along the site. Cross sections were taken at 50-foot intervals and at grade breaks where necessary. Digital terrain models of the existing surface were generated and quantities were calculated using the average end method. As-built cross sections of finished asphalt grades were provided to the engineer upon completion. The entire project was sloped staked at 50ft intervals and including PCs and PTs with a 15ft reference point. Final staking of pavement from beginning to end of project; staking at 50-foot intervals, PCs, PTs, Grade Breaks, etc; staking of culverts and other crossings; finishing stakes (blue-tops) on subgrade, subbase course, and aggregate base at EP, 1/4 crown, and center line at 50-foot intervals to meet FAA tolerance. As a subconsultant to Civil Survey Consultants, Land Solutions provided construction staking on the final phases of this roadway improvement project for the Ada County Highway District. Construction staking included curb and gutter staking and setting finishing stakes on the aggregate base course. Lakeshore Drive Reconstruction--Slope Staking; Nampa, Idaho; Riedesel & Associates, Inc.
As a subconsultant to Riedesel & Associates, Land Solutions provided slope staking on the Lakeshore Drive Reconstruction project in Nampa. Land Solutions performed slope staking of the design surface (approximately 3.2 miles) to include the following: conduct control surveying to establish surveying control; slope staking at catches for the entire project; PCs, PTs; grade breaks, angle points, at 100-foot intervals along the tangents, and at 50-foot intervals along curves; and set a 5-foot reference point behind every slope stake set with all information included on the slope stake. Land Solutions provided GPS control surveying services along the township lines between Townships 4 North and 5 North, Townships 3 North and 4 North, and between Ranges 1 West and 1 East. Following the adjustment and reduction of the data, a report was generated that included the following: a detailed description of post-processing methods and results; all documentation from field observations; values of all points observed in Geodetic Coordinates; State Plane Coordinates; Ada County GIS Base Map Datum; network adjustment map; and network adjustment report. This report is published on the Ada County Surveyors web site. Land Solutions is providing the condominium platting for this large scale condominium project located in Boise, just west of the Boise River and east of Kathryn Albertsons Park, south of Interstate 184. The project consists of four — 6 unit multi-level buildings and 10 — 8 unit multi level buildings, for a total of 104 condominium units, along with a large clubhouse and pool area. This project is currently in the review stages with the City of Boise. Land Solutions is providing platting for these condominiums located on Warm Springs Avenue in Boise. This large, existing multi-level 4 plex building is being re-modeled and condominiumized, and is located in the Historical District. Land Solutions provided the initial boundary survey of the property and resolved discrepancies, prepared the preliminary plat for the City of Boise submittal, and prepared and submitted the final plat. The project is currently in the review stage with the City of Boise. Land Solutions was brought onto the project after the Preliminary Plat had been approved for the project. Land Solutions was contracted as a consultant to resolve discrepancies in the exterior boundaries, verify and supplement existing topographical mapping, provide construction staking for the project, and provide platting of the condominium. Legal descriptions of the corrected boundary were also provided to the client. This is an infill project located on Morris Hill, just east of Philippi, and consists of 34 units. Land Solutions was chosen for this project from a group of three different surveying firms that were recommended to the client. Extensive research was performed to resolve and establish the exterior boundary for the project, some of the deeds reaching as far back as the late 1800s. A boundary survey, topographic mapping, legal descriptions, and preliminary and final platting were performed. This project is located on 10th Street, just north of Resseguie, and consists of 4 units. Land Solutions provided boundary, topographical mapping, construction staking, and platting services for this condominium project located just off of Hill Road. This project consists of 13 units. Land Solutions has provided surveying services on various subdivision projects, the most recent projects being the Bluemeadows Subdivision No. 2, Hacienda Subdivision, Ryan Meadows No. 3, Waltman Court Subdivision, Hollybrook Subdivision, Wyndstone Place Business Park, Lexington Meadows, Sicily Subdivision, Skylight Subdivision, Copper Creek Subdivision, Ambercreek Subdivision, Virginia Park Subdivision No. 6, Lighthouse Subdivision, Reflection Ridge Subdivision, Cedarcreek Subdivision, Virginia Park Subdivision No. 6, and Pebblecreek Subdivision. Services for most of these projects included the following: a boundary survey, including research of deeds and easements of record; control surveying to establish subject property lines; monument setting at property corners; Record of Survey drawing; and legal descriptions (metes and bounds) of the property boundaries. Topographical surveying included control surveying to establish NAVD 88 datum and surveying of the proposed development site; drafting of field data into a base map using the consultant's preferred layers and line-types in AutoCAD format and generation of a digital terrain model (DTM) to create contours. In addition, Land Solutions has provided construction staking and platting of the subdivisions.